Mark Lipman, the eclectic, often irreverent, but always humorous leader of the Asbury Park-based band Lip Man and The Lips, died Christmas morning at age 65. “It’s like I lost more than half of myself,” Mark’s wife, Joan, said this week. The couple were married for more than three decades. The band’s original songs were usually about food, drink, humorous Mexican-themed situations, old hippies, mid-life crises, pets, aging, and other fun and odd situations in life. “Mark was a sweet, warm and fun guy. He was a tender human being,” musician and concert promoter Tony Pallagrosi said. “He and Joan seemed to have a wonderful life together for many years and their band was always cool and interesting. It was always humorous and it exemplified who they were as people,” he said. Band members over the years included Bobby Alfano, Gary Cavico, Joe “Bop” Tomek, Gerry Gironda, Mike Levin, Dave Mains, Ruth Smith, Susan Greenberg and many others. The Lipmans lived in Asbury Park during the early 1980s but relocated to Florida after Mark took a job there. Both Mark and Joan, a former Asbury Park deputy clerk, always considered Asbury Park their real home. Two years ago the couple returned to Asbury Park after 20 years when Mark retired. Calling Asbury Park, their “our heart and soul,” Joan said she wishes Mark could have enjoyed it longer. “We hated Florida and always wanted to come back. These last two years were the best of our lives and I wish Mark could have been here longer,” she said. The couple are originally from other towns in New Jersey and first met outside the Howard Johnson’s on the boardwalk in Asbury Park. Joan was the city’s deputy clerk for 14 years until she and Mark moved to Florida in 1994, with Kiki Tomek taking her place in the city post. 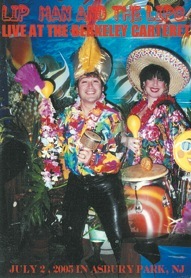 Kiki’s husband, drummer Joe “Bop” Tomek, also played in Lip Man and the Lips. “Joe and Mark were two of a kind between their humor and their music; it was just amazing,” she said. Tomek noted that Mark was always a positive influence on everybody’s life. “I never saw Mark without a smile and I never heard him say a bad word about anybody- he was a wonderful person and their concerts were always fun,” she said. “You couldn’t help but smile when they started playing and I miss them terribly already,” she said. Lip Man and the Lips first gig was on the Asbury Park boardwalk at Midge Guerrera’s Caffe e Dolce in the 1ate 980s. “They played here first and, after they played, they became a mainstay at my bistro and were even featured in a NJ Network segment about my café,” she said. “Coupled with their music and antics, they always brought applause, guffaws and raucous laughter to my place. I think Mark will be missed but his music and his joy will live on forever in the memories of anyone who heard him play,” she said. Joan said that it would have been difficult to put Lip Man and The Lips back together again after so many years. “But there is no chance now that Mark is gone,” she said. She said that many musicians and friends showed up on Dec. 27 at the American Legion on Gully Road in Neptune to celebrate Mark’s life. “The place was overflowing and there must have been 300 people there,” she said. Lip Man and the Lips was featured on the Doctor Demento Show and on VH1. The band performed an original song on VH1 in a salute to Springsteen in the early 1990s. The band, featuring Joe “Bop” Tomek,” was the opening act for the October, 1992 reopening of the Stone Pony and also played for many charitable organizations and events. Posted in Uncategorized and tagged Asbury Park, Don Stine, Music.